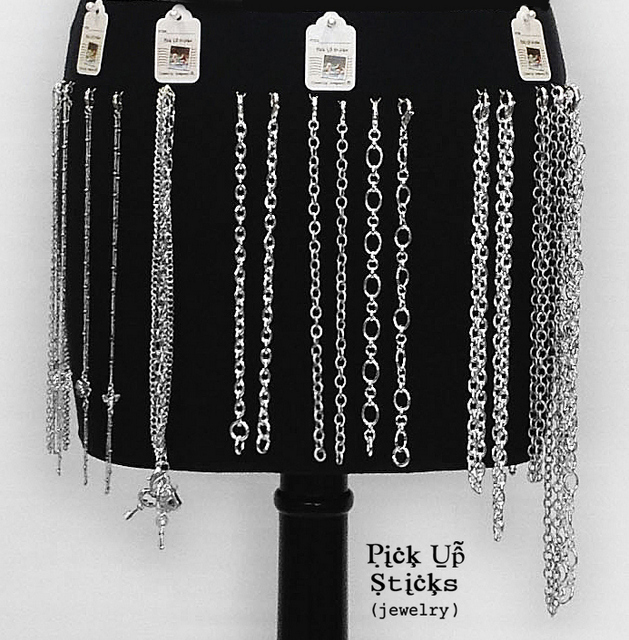 Just one example of the Pick Up Sticks necklaces jewelry you can create after locating your favorite Pick Up Sticks retailer. We’re always telling you how much we love our Pick Up Sticks retailers, and we try to feature one of them in a blog post on a regular basis. But have you found one near you? Do you have a favorite Pick Up Sticks retailer of your own? If you’re really going to go green and support your hometown economy, there’s nothing like shopping and buying locally. Pick Up Sticks retailers already know how fabulous the line is, and they’ll show you their bestsellers as well as what’s new. 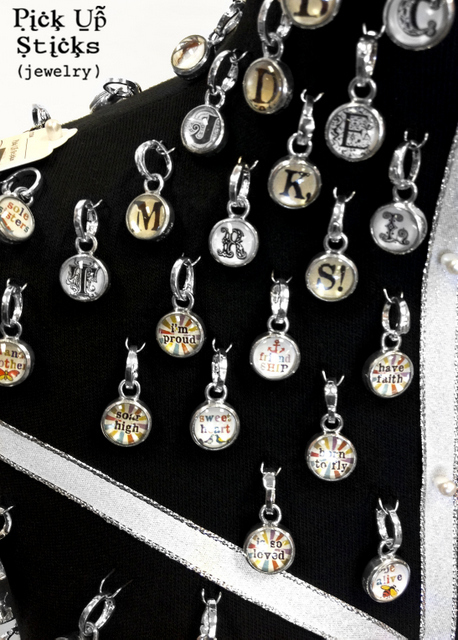 Probably one of the greatest advantages to buying from one of our retailers is that they’re happy to help you assemble your necklace and bracelets once you find the perfect combination of charms and trinkets. They can keep you informed about when new designs arrive so that you can add to your collection. Another benefit of buying from a local retailer is that you don’t have to pay for shipping. 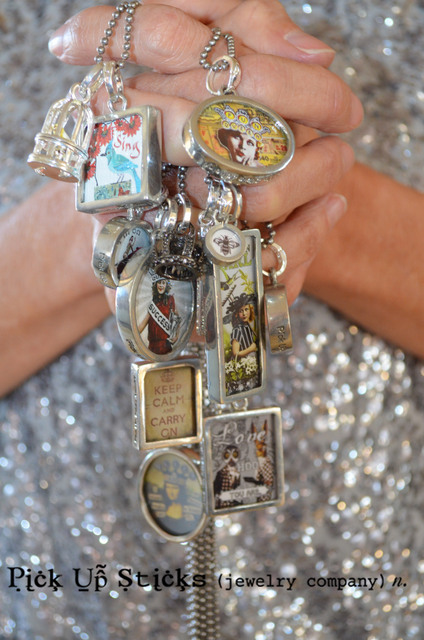 And if you are looking for a favorite charm from the past that might have been discontinued from our line, call around to a few brick and mortar Mom and Pop stores to see if they have it in stock. 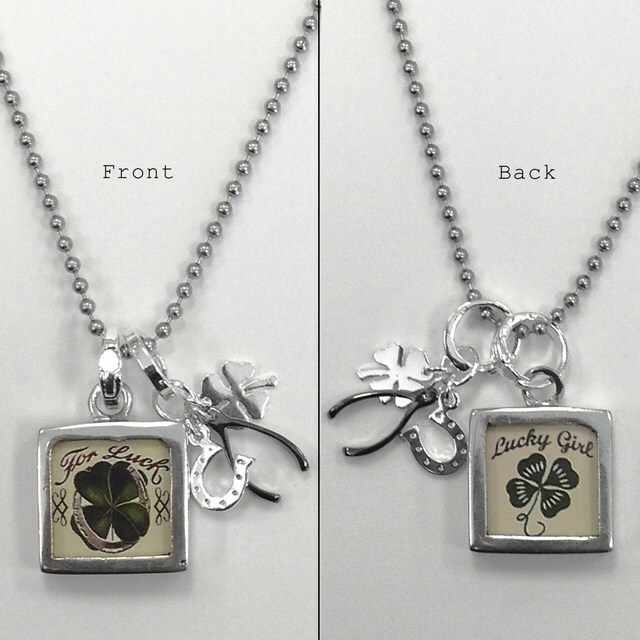 Often you can find special charms that aren’t available from an online store. As you already know, getting your hands on Pick Up Sticks is a satisfying shopping experience – they’re even better in person than in these pictures! You can always go to our website and find a store carrying Pick Up Sticks near you. Or check out the links in the column on the left of this blog post – we’ve been pleased to link to several retailers who asked to be included here. Happy shopping. If you already have a favorite Pick Up Sticks retail store, let us know who they are so we can give them a shout out on our Facebook page. If all your best efforts to find a local retailer are unsuccessful, suggest to your favorite store owners that they carry the line. And finally, if all else fails, or if you’re living in a remote area that only the UPS guy can find, you’re welcome to shop the Pick Up Sticks retail website. For those of you who don’t know me, I’m Bunny Terry, the Pick Up Sticks blogger, copywriter, editorial submissions queen, etc. If someone at Pick Up Sticks needs a piece of content created, they call me. Remember those previous posts about the Inspiring Spaces of Pick Up Sticks? 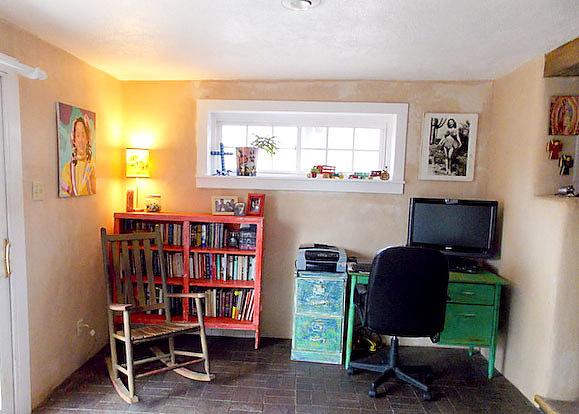 Sabrina’s funky, eclectic home filled with light? Glena’s colorful, comfy, gorgeous space? 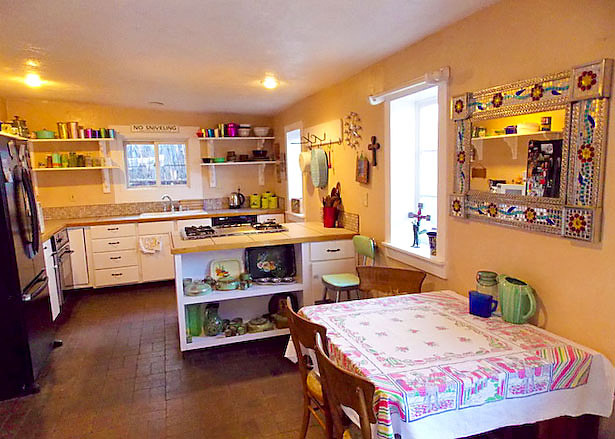 Candace’s warm and inviting home she shares with her hubby and adorable Jemma the toddler? I had fun writing those posts, and was just a bit envious (as we all are when we see someone else’s fabulous home). Then I looked around. And I realized that my own space was pretty inspiring, especially given my sometimes scattered, hard-to-pin-down style based almost entirely on whatever strikes my fancy at the moment I see it. 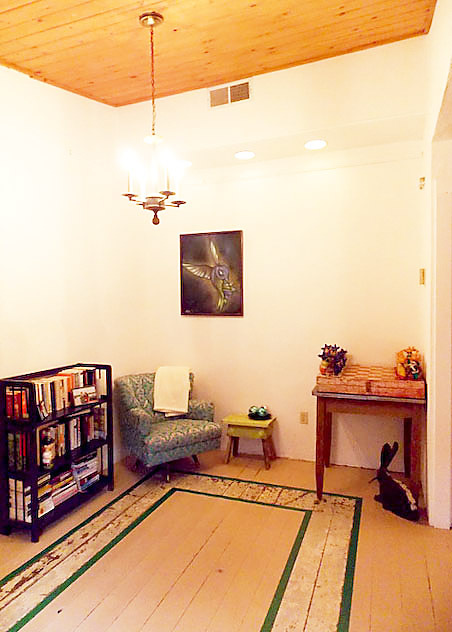 Entryway/Library. Check out the oversized Mexican chess set. Made of papier mache, picked up at a little junk store in Texas for $25. I didn’t plan to make it creative space. 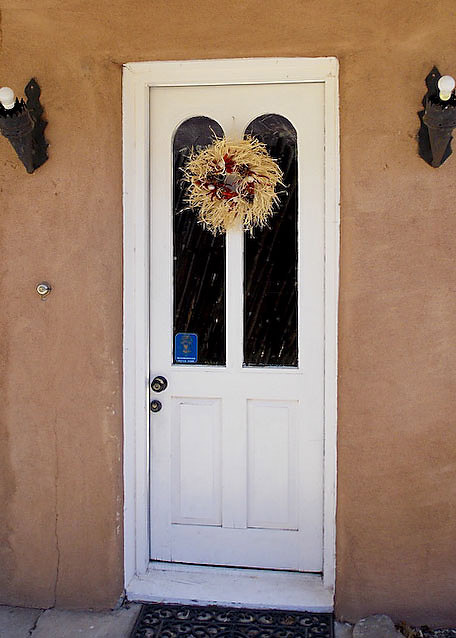 I recently moved to Santa Fe into a nearly 100-year old adobe home and furnished it with my collection of Mexican folk art and eclectic furnishings. 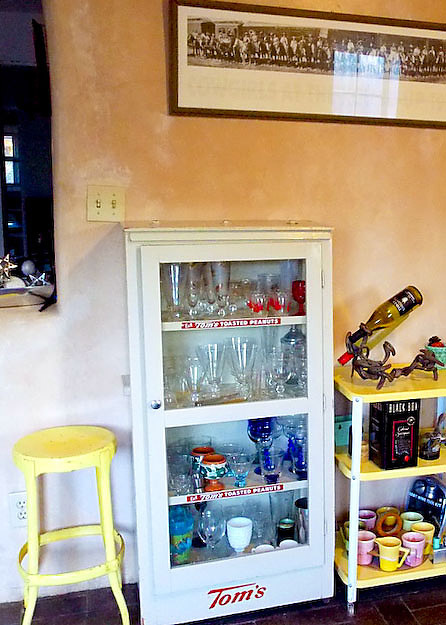 There’s an odd mix of memorabilia here in my home – a Tom’s candy cabinet from my childhood, a collection of aluminum cups and pitchers from my 20’s, a full set of Frankoma dishware I snuck out of an estate sale in Albuquerque for almost nothing, brightly painted furniture (some by me, some by a Santa Fe local with a crazy paintbrush), interesting artwork that probably wouldn’t please anyone else besides me. . . 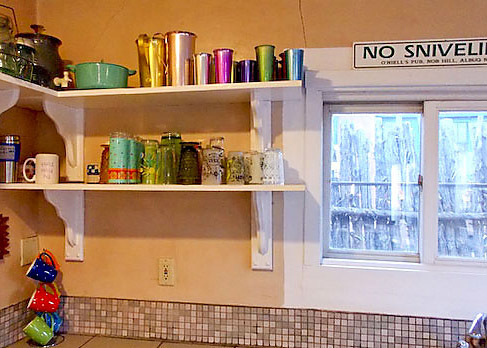 In my prior home in Logan, New Mexico (the hometown I share with Glena and Sabrina), I had a very efficient little office with lots of shelves and a view of Ute Lake. But it wasn’t necessarily inspiring (unless you count wanting to leave my desk and walk down to the lake as a form of inspiration rather than distraction). It was utilitarian. And I wrote there, creating blog posts and web copy and a few editorial submissions. But Santa Fe is different. I’ve made this space my own. 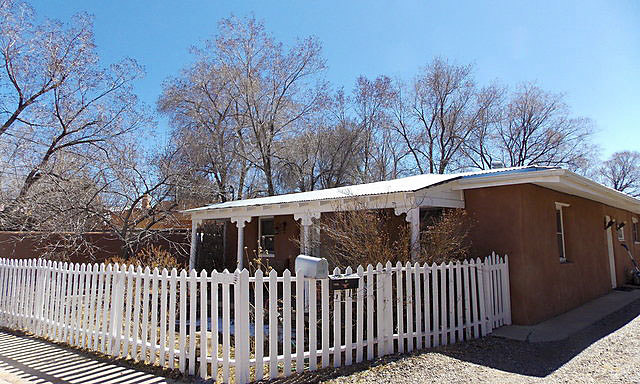 I love my little house with its wide portal and picket fence. 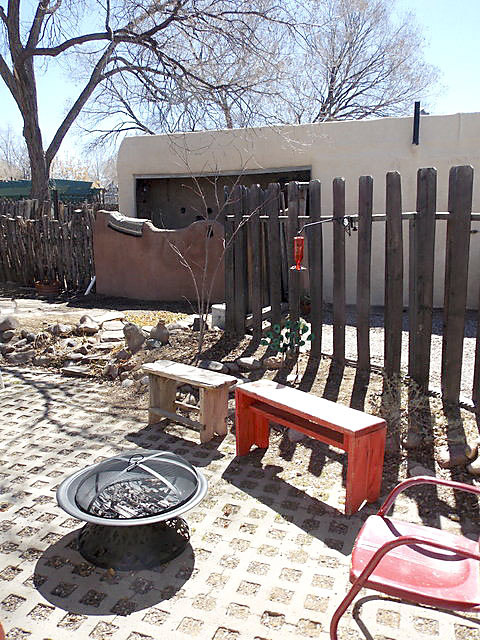 I love the back patio with its flagstone and coyote fencing. But best of all I love the interior space where I can display my odd collections while the sun shines on the brick floor in my office. It makes me want to write for hours. And when I’m done with the blogging and copywriting and editorializing? I’m four blocks from the Cowgirl BBQ and the Railyard District and Second Street Brewery. About seven blocks to the Plaza and Del Charo. Because, no matter how creative your job requires you to be, a girl’s always gonna need a break for a margarita and some green chile enchiladas at some point. This post is our “Welcome” piece for Treyla, the new girl in the Pick Up Sticks studio. She was born in Clovis but grew up in Eugene, Oregon. 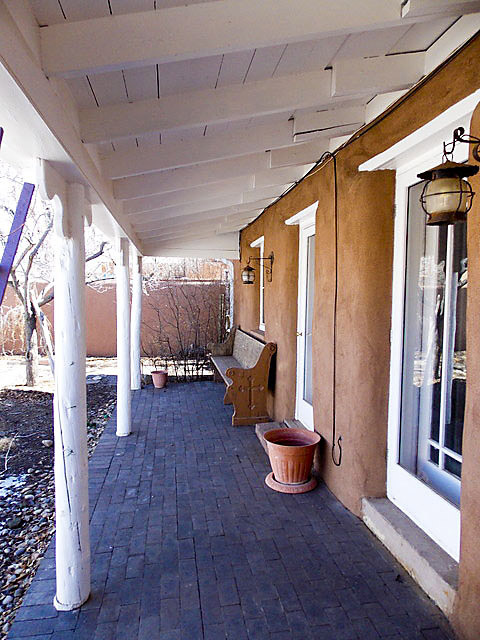 After high school she decided she missed the eastern plains of New Mexico, and came home. 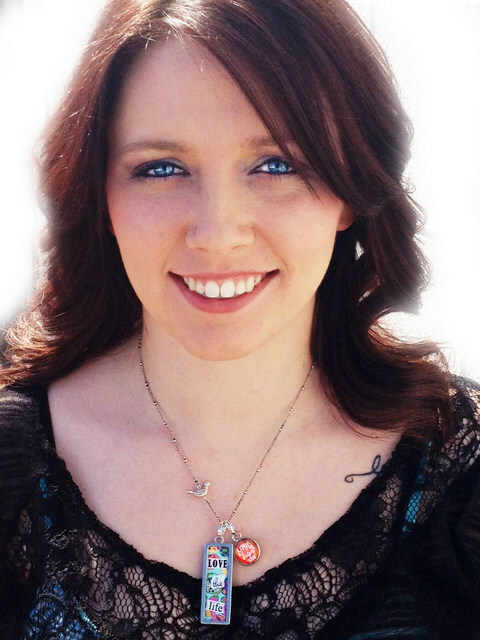 She has a daughter, two year-old Austyn, and is very happily married to Oran. Besides her family, her favorite things in the world are her two Labs, Tiki and Daisy. She’s also a bit of a Modge Podge fanatic and a fan of the Oregon Ducks. “When I saw charms Live the Life (LV051) and Life is Good (BB011), they instantly became my favorite! Everywhere I have been shopping recently, I have been drawn to anything with birds on it. The chain (NK001) has an adorable little bird that sits up higher on the necklace and it adds a unique look you don’t see in other jewelry. 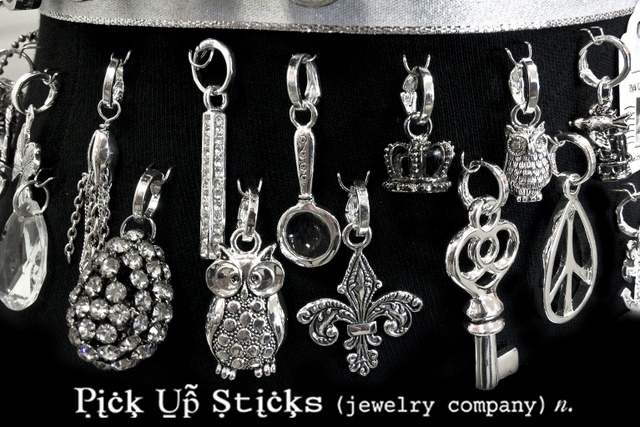 We’d love to hear about your favorite Pick Up Sticks necklace. Send us a photo and your own story at marketing@pickupsticks.net and you just might be featured in a future blog post! 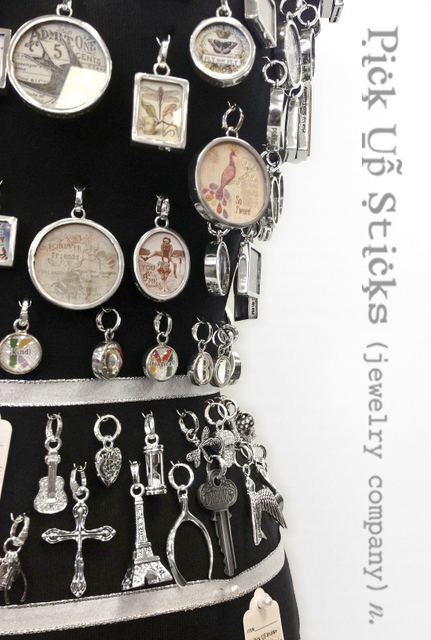 Like Glena, the rest of us find it tricky to narrow our Pick Up Sticks choices to just one or two necklaces, and given the versatility of our two-sided charms and the ease of using the magic clips, you don’t have to! If you’re one of our retailers, we hope you’ve been fortunate enough to meet Candace, the Pick Up Sticks girl who enthusiastically greets you in the booth at market and takes your order when you phone or e-mail the office. She’s indispensable as well as being our biggest fan. We couldn’t do our job without her. 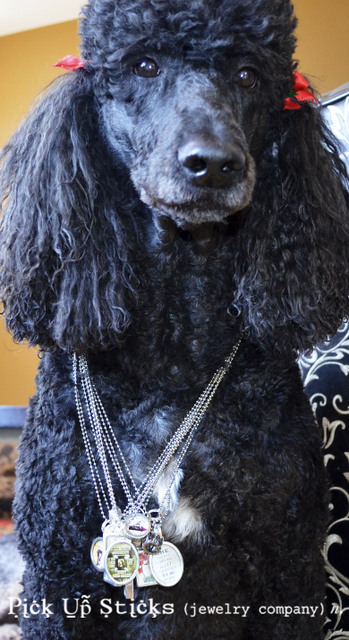 When we asked her to tell us about her favorite necklace, charm and trinket combination, she couldn’t limit her choice to just one. 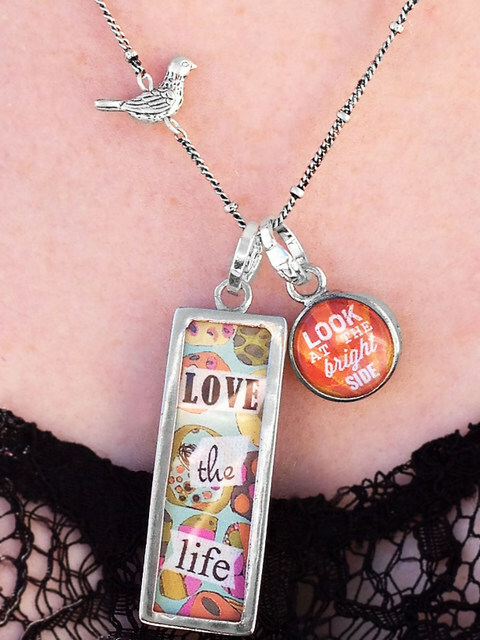 So here are a couple. .
Do you have a favorite necklace combo? We’d love to hear about and see it. . .just e-mail a description and images to us at marketing@pickupsticks.net and we may feature it on Facebook or right here. 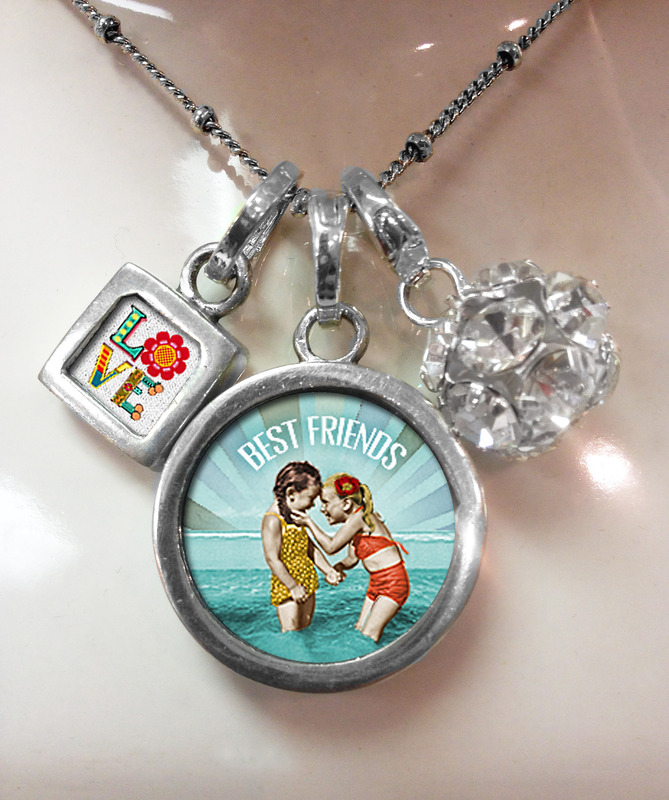 Employee Favorite Necklaces – Leigh’s Favorites! “Grow Strong” is my favorite charm because that feels exactly like what I am doing with my life right now. In the past few years, I’ve endured some difficulty and hardship. Without going into detail, I can honestly say that, looking back, I see that I did in fact grow stronger despite some really distressing times. And I know without a doubt that I would never have wanted an easier path to where I am now. This simple statement, “Grow Strong” alone says and means so much (probably to a lot of folks). I will no longer underestimate myself nor others. I also hope to use this as almost an inspiration to others. Thanks, Leigh, for joining us at Pick Up Sticks. We love your choice and your story!